the First Temple Tombs follows. The Jerusalem neighborhood of Silwan is located southeast of the southeastern corner of the Old City wall. It is east of the "City of David,"and just east of, and above, a portion of the Kidron Valley. The village it self is built over 50 tombs from the 8th and 7th centuries B.C. This necropolis – "city of the dead" – was investigated by David Ussishkin and Gabriel Barkay between 1968 and 1971. Investigations of this area are very difficult for the inhabitants of Silwan are normally very hostile to outsiders. The two most famous tombs from this necropolis are "the Tomb of Pharaoh’s Daughter" and the "Tomb of the Royal Steward." For a popular description of this necropolis see: Shanks, Hershel. 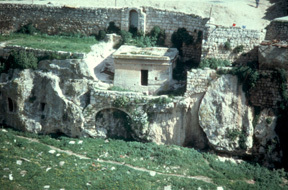 "The Tombs of Silwan." Biblical Archaeology Review, vol. 20, no. 3 (May/June, 1994):38-51. You also may be interested in viewing the First Temple Tombs found on the grounds of the Ecole Biblique in Jerusalem - Click Here.